Posted on: 8th April 2010 Comments! For beer drinkers, a new study that suggests beer is a significant source of a mineral key to maintaining bone density may sound too good to be true. That may well be, say health experts who overwhelmingly agree the the connection may be more wishful thinking than solid science. But that may not stop many brew lovers from viewing the new research as an excuse to order another round. The study of 100 commercial beers in the February issue of the Journal of the Science of Food and Agriculture by Charles Bamforth and Troy Casey of the University of California Davis examined the silicon content that results from different ingredients and brewing processes. "Silicon impacts bone mineral density in humans, and supplementing silicon in the diets of osteoporitic women increased bone mineral density," the authors wrote. Thus, they surmise, silicon-rich beer may also help to strengthen bones. That may well be, say health experts who overwhelmingly agree the the connection may be more wishful thinking than solid science. But that may not stop many brew lovers from viewing the new research as an excuse to order another round. The study of 100 commercial beers in the February issue of the Journal of the Science of Food and Agriculture by Charles Bamforth and Troy Casey of the University of California Davis examined the silicon content that results from different ingredients and brewing processes. "Silicon impacts bone mineral density in humans, and supplementing silicon in the diets of osteoporitic women increased bone mineral density," the authors wrote. 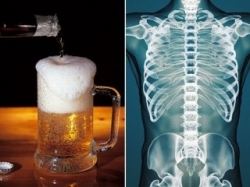 Thus, they surmise, silicon-rich beer may also help to strengthen bones.